Control panels from an established UK manufacturer who understands the need to deliver reliable, flexible, cost-effective quality. Control panel design and manufacture is one of Denca Controls’ core business activities. We manufacture panels for both the end-user and OEM markets. Whilst most of our end-user panels are supplied as core elements of integrated systems projects, we also produce panels to OEM specifications either as one-offs or as a batch production. Flexibility is high on our agenda, and we are proud of our ability to meet tight deadlines. If you need a rapid throughput, talk to us. We will do what we can to help. Denca can supply your control panel cabinet from Stainless steel/GRP/custom build/ custom powder coated to any RAL colour of your choice. Electrical enclosures and cabinets from Denca can be made to fit to any of the IEC 60529 standards for ingress protection. Speak to us first as we are always happy to discuss your needs. Do you actually need a new panel? If it isn’t broke why fix it? However, sometimes upgrades can be a good thing helping bring up to date electrical controls technology to your legacy equipment. Modern PLC’s/ HMI’s SCADA, motors and software can give a new lease of life to older equipment yielding efficiency improvements, save energy and help keep older equipment competitive. We can offer cost-effective onsite modifications to old out of date panels. This list indicates the scope of our experience but isn’t comprehensive so whatever your panel requirements, give us a call. 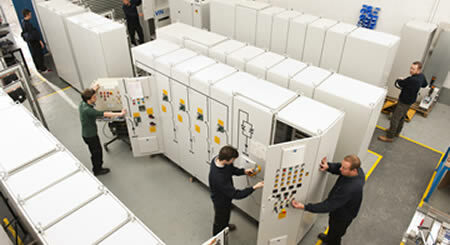 We are specialists at producing bespoke systems.